So… let’s clarify something for those who aren’t up to speed just yet: none of that is true. 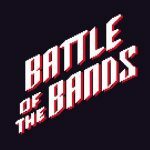 It is, however, how I started my most recent game of Battle of the Bands, a card game which has you not only making up your own back story from a pair of random prompts each time, but also going out on tour and trying to gain fans quicker than any other band competing against you. Yup, you’re not imagining it, the board is a t-shirt. Not only that, it’s a fully wearable t-shirt with the pixelated game logo on the front too. It’s a weird sounding idea at first, but when you think about things it actually makes sense – go to any gig for almost any band and what’s on sale? T-shirts. Also given that, as you can see, there’s a very specific layout for the cards it acts like a play mat, the likes of which you’d usually only see on a complex deck building game and as such is a very handy thing to have in the box. It’s pretty big and will fill the playing surface of a lot of tables, but as you only really need the space offered by the shirt in order to play that’s not really a problem. The other two components are the cards themselves and a set of badges, basically player pieces but again opting to follow the theme of merchandise that might be picked up at a fledgling band’s concerts. 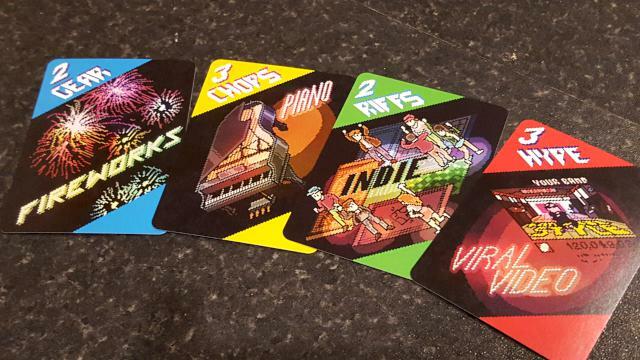 It all gives Battle of the Bands a very different feel to other card-based games, but in a market that’s increasingly difficult to get noticed in that’s sometimes what you need to get a really good game into the public eye. 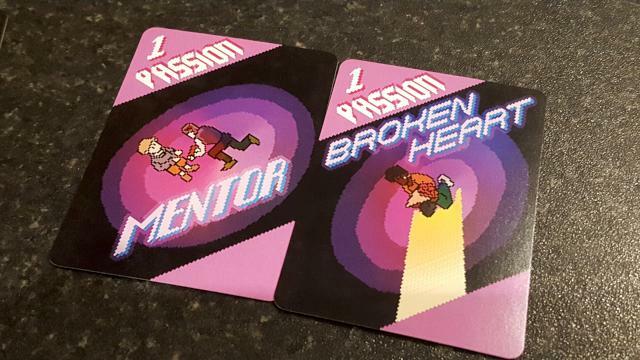 The cards all carry an 80s feel pixel based art style which is starting to become pretty common again in terms of independent video games, but it isn’t something you see much on board games. Personally, I quite liked it, but I’ll show you the cards which prompted my story at the beginning and you can judge for yourself. In terms of playing the game, it’s pretty simple. 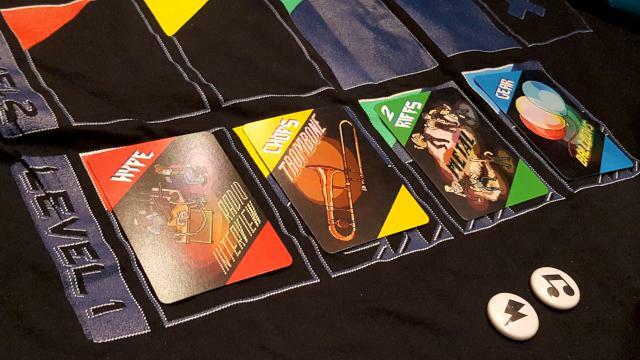 On each turn a player can stay and practise (whereby they take a career card, giving them a card from the 4 main “suits” you can see on the shirt: hype, chops, riffs and gear) or choose to go out on tour. 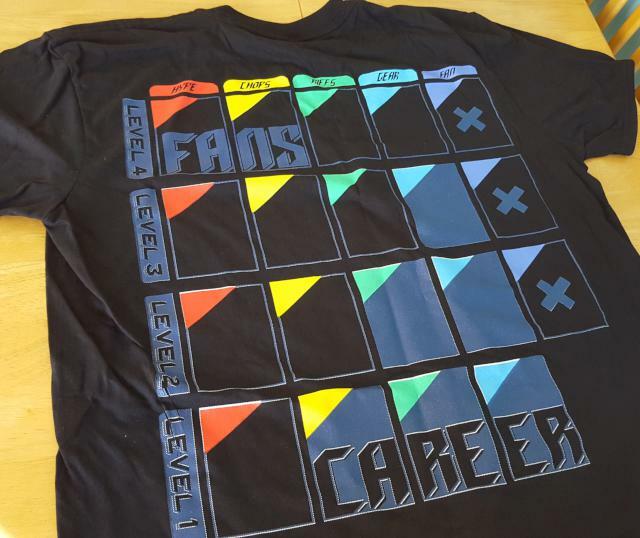 Creating a tour requires you to place a card from each suit in the relevant column on the shirt, starting at the bottom row. You can fill in multiple rows if you want for a more epic and rewarding tour, but of course you need more cards for that. The big catch when playing this is that you will, almost inevitably, need to call on the help from other players to form your tours. Especially early on when you’ve been picking up cards for a few turns and desperately want to create a tour, you might be a riff short, or not have any kind of hype to set up your tour. In such an occasion you will need to enlist the help of others, which is great in that it lets you create a tour, but also severely limits how much you can benefit from it. It’s a bit like bringing in a drummer from another band, then having to give them half the earnings and sit by and watch them eat most of the pre-gig pizza. You couldn’t do it without them, but whether you like it or not you’re going to get screwed over. The earnings from your tour depend on which cards you put down, and there they’re placed. Cards placed in one of the career spots earn career cards, with the number determined by the value on each card in those spots. In the image above, my balloon-filled trombone metal tour (who wouldn’t want to go to that??) only earns me 2 career cards from my green “riff” card – the others are effectively worthless when it comes to earning something from the tour. If I’ve enlisted help from others they get to share those cards depending on how people position their badges, otherwise they’re pretty much all mine to keep hold of. The higher up the “board” you get (thus needing far more career cards to instigate the tour) the more likely you are to gain fans, and as fans are this game’s version of victory points you’ll be wanting to reach the bigger tours as soon as possible. And that’s pretty much Battle of the Bands. You build your hand of cards, play them strategically to build up some badass tours and develop a need to negotiate with and rope in help from other players. It is, in fact, entirely possible to pick up a few fans without even going on tour at any point and just helping others, but trying to win this way is a very risky business; you’ll probably find you’ve already lost before that plan starts to bring you any luck. But when all is said and done Battle of the Bands is an easy to learn, easy to play game which is also very easy to enjoy. As a member of a few failed bands myself the theme of the game really shone for me, and while the art style won’t be to everyone’s liking I really liked it – in fact the whole thing felt like a well thought out, well-themed product. With the t-shirt board and the badge player markers you get the feel of a band’s early tours, and after a while you might even start to abandon the higher scoring tours in favour of some more entertaining combinations of styles and instruments – there are certainly enough cards to warrant that becoming an option. So for those who like their music, and love their card based games, this should be a no-brainer. It’s light, doesn’t need a long time to play and can be picked up in no time. If the Kickstarter is still running by the time you read this then I’d strongly recommend you drop a few quid into this game; it definitely deserves to be brought to life. You can back Battle of the Bands at http://www.battleofthebandscardgame.com – do so! Now!